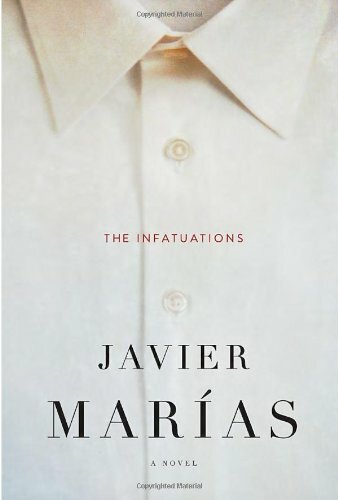 The Infatuations takes place in Madrid, Spain. This is a story of murder, narrated in first person, written in Spanish and translated into English, and is based entirely on one woman’s observations and ponderings. Early on, we see that Mara is a pitiable character. She is presented as a hopeless woman who detests her job, despises the authors she works with, and generally sees no real point in living. Then Maria’s sole enjoyment in life is taken from her with the brutal murder of the husband. Her life changes in ways she could not have imagined—and thus begins the tedium. The rest of the book is filled mostly with repetitive cogitations about the effect of death on the living, the empty “nothingness” of Maria’s own life, and the meaningless of life in general. Maria would not know if life holds any meaning as she does not live. She merely exists. She lets her time slip by, does not believe in justice or injustice. In fact, we never really learn what, if anything, she does believe in, and by this point in the novel, about 30% of the way in, perhaps we don’t really care. The story is described as an immersive, provocative novel, yet the only sense it stimulates is irritation. The only likable character, Miguel Desverne, is killed early on in the book, and the reader barely gets to know him before his character is snuffed out. Nothing in Maria’s life is good and it does not get any better. This is not a feel-good story. There is no plot, and therefore the reader is not engaged. As Maria is paralyzed by the meaningless of her own existence, she renders the reader powerless to care about it, too. The wretched emotional state of this woman transmits throughout the book, kindling neither compassion nor sorrow. How do you give a damn for such a weak character, one aspiring to be nothing more than a fallback for the object of her desire, willing to settle for whatever dismal morsels come her way? She wants something, yet she is not prepared to go after it. Maria is not a mystery to the reader. She is boring and bland and unlikable. She has weaknesses and no strengths. Even as she learns the most appalling truths about the man she loves, she callously accepts them and does nothing. Her infatuations are unhealthy. Her expanding ruminations leave the reader confused and questioning what is real and what is imagined. The text rambles. Diaz-Varela, the object of Maria’s desire, is described as having discursive tendencies—a trait shared by the author. One internal soliloquy goes on for five and a half pages with no respite. Maria’s character is entirely submissive. The author uses the term “acquiescent,” and then goes on to give an example of what acquiescent means. This demonstrates a lack of confidence in the reader. There is little dialogue, no hero, and no journey. Madrid is a probably a beautiful city, yet the author gives the reader no feeling for the surroundings. Rather than the “brilliantly re-imagined murder mystery” we are promised, The Infatuations is long, depressing, and plodding. Jenny Hilborne is the author of mysteries and thrillers, including Hide and Seek, Madness and Murder, and No Alibi. She currently reviews books for Suspense magazine. In 2011, she was invited to judge submissions for the 2012 International Thriller Awards Competition.